Starting in January 1942, under the War Measures Act the Canadian Government declared the removal of “all persons of Japanese racial origin” from a 100 mile protected zone along the British Columbia Pacific coastline. This was the start of over 22,000 Japanese being uprooted from British Columbia for “security measures”. They were evacuated solely on the basis of their racial ancestry, not on their citizenship or their country of birth. 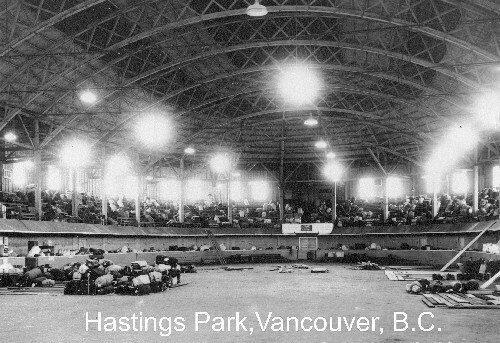 The buildings of the Pacific National Exhibition in Hasting Park were used as a temporary facility to hold the Japanese from the islands and the area outside of Vancouver. The guarded facility opened in mid March 1942 until the government was able to evacuate them to more permanent housing in the interior of the province. The evacuees were limited in the amount of luggage they could take with them, up to 150 pounds for women and 75 pounds for children. This clearing station bulged with 3000 lodged behind its wire fence.